If you have experienced the tragedy of a flood, choosing the right flood cleanup company can make all the difference in determining how much of your property can be saved. Not all flood cleanup companies are created equal! With decades of flood cleanup experience, we know “what it takes” to get your flood cleaned up the right way – to minimize inconvenience and maximize the amount of property you are able to save! You need a flood cleanup company that is on-call 24/7 – because immediate flood cleanup is necessary to prevent secondary water damage to your structure and your possessions. Mold, fungi, bacteria or other microbial contamination can invade wet items within hours – ruining them forever. Don’t wait for regular “business hours” – call a 24/7 flood cleanup company. Rapidly dried possessions and property can often be saved But mold, fungus and bacteria can invade wet items and ruin them forever if you wait. Ask your flood cleanup company if they can be there within one hour – because we can! Choosing any kind of service provider can be a daunting proposition. 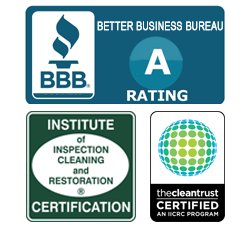 Only trust your flood damage cleanup and property restoration to a flood cleanup company that is Better Business A Rated – like we are! Most homeowners have a sizable deductible when submitting a flood cleanup claim to their homeowners insurance. We know that a flood is not something you planned or saved for – so we cover your flood cleanup deductible for you! Never trust a flood cleanup company that will not give you a free flood cleanup estimate “up front.” We let you know exactly what your costs will be – and we work directly with your homeowners insurance company to get as much as possible covered by your insurance. Our experienced flood cleanup technicians are fully trained and certified by the Institute of Inspection, Cleaning and Restoration Certification (IICRC). Do not trust the restoration of your home and valued possessions to amateurs! We have the latest state-of-the-art pumping methods and vacuum equipment needed to remove every drop of water from all flooring, walls, furniture, structures and personal property. Fans and “air drying” do not dry rapidly enough to prevent bacteria and mold from invading after a flood. We also have the latest technologies in Dehumidification Equipment to removes any remaining water or moisture retained by the air and building structures. And we have the best, safest, most effective sanitizing & odor removing products to help restore your home and property. We use eco-friendly – yet very powerful – industrial grade products to kill all germs & bacteria and remove musty or moldy smells. Don’t be afraid to ask your flood cleanup company if they are licensed, bonded and insured! Aaron’s Restoration is fully licensed, bonded and insured for your protection and complete peace of mind! Our flood cleanup team is committed to restoring your home or business back to its original condition as rapidly as possible, while ensuring the work is done thoroughly and completely. If you have experienced a flood in Wayne, Macomb or Oakland County, we are here to provide flood cleanup 24/7. We will rapidly clean up the flood damage – and also help you identify the cause of the flooding so that we can also help you prevent future flood cleanup!